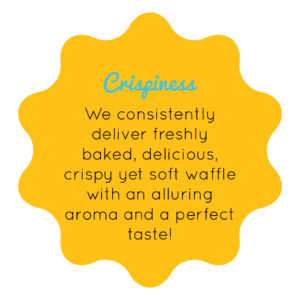 Owned and operated by Bloombay Enterprises LLP, The Belgian Waffle Co. was an idea born out of passion and with a mission to spread taste and delight. Founded in 2015, the company strives to constantly innovate while staying true to its values of excellence, simplicity and affordability. Shrey was working in Manila abroad and there he came very close to unveiling the various interesting food concepts which were available. Waffle as a concept attracted him. He saw tremendous potential to bring the product to India in a big way, customized in an easy to eat and affordable format. This led to the birth of The Belgian Waffle Co. The Belgian Waffle Co. is one of the first Waffle Specialty stations in India that offers a unique, on-the-go waffle sandwich created fresh at our waffle stations with our specially formulated egg-less batter and premium fillings. BWC pride itself on providing a continuously innovating yet consistent top quality product with a warm and dependable brand identity.